It's not easy surprising Carolyn Neitzke. After all, she's the director of conference services and in charge of knowing what events are happening where on the UIS campus. 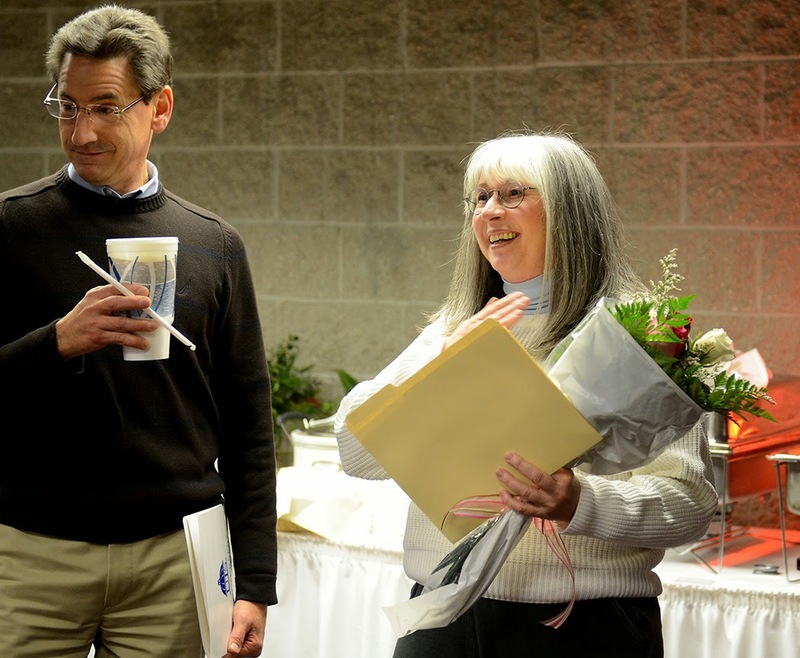 However, when she walked into a conference room last week, she was stopped in her tracks when she saw friends, family, and co-workers waiting to congratulate her for being named the University of Illinois Springfield Employee of the Month for December 2013. Her nominator says Carolyn "epitomizes everything that an Employee of the Month should be: she's incredibly organized, efficient, and thorough as she plans and executes the many events for which she's responsible." In addition, she's friendly and kind and maintains those qualities regardless of the kind of workday she's experiencing. "It cannot be easy to maintain her welcoming nature and good humor in the midst of the chaos in which she often finds herself and yet Carolyn somehow finds a way to do so," her nominator writes. Her colleagues are not the only ones to notice Carolyn's friendliness, humor, and dedication to doing a good job. The public have also chimed in by contacting her supervisor after events to express how much they appreciated the attention they received from Carolyn and her staff. "Carolyn is a GREAT lady with a wonderful work/life outlook and is an invaluable ambassador for UIS," writes her nominator.